Most people who turn 70 usually are happy blowing out a bunch of candles on a birthday cake. Capoeira teacher Mestre Acordeon, who turns 70 on Aug. 30, will celebrate by undertaking an epic bike ride from his home in Berkeley, Calif., down to Bahia, Brazil. It’s not a straight shot; he plans to make stops along the way, teaching Capoeira, which is a Brazilian martial art, and getting to know the people wherever he visits. “I want to improve as a Capoeira teacher and as a human being,” Acordeon told Yahoo News over the phone. It sounds like a lot for anyone, let alone a septuagenarian, but Acordeon has a mission. “It’s not a marathon. It’s not a bicycle competition. It is an encounter with myself,” Acordeon said. He said the most he has ridden is 165 miles. For this trip, he plans to ride five to six hours a day, or 45 to 50 miles. Some days less, some days more. 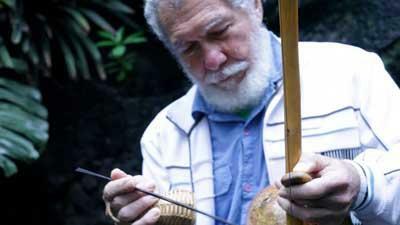 Although he hopes to be in Bahia for his 71st birthday, he has allowed 400 days for the journey, so he might not be. The Brazilian native, who promotes Capoeira around the world, has wanted to make the trip for years but never had the time. Now, he’ll incorporate all his interests into one epic adventure. He is raising money to make a documentary film about his experience. He also plans to record music to tie in with the film. A few of his students will be making the trip as well. “It’s not something that comes around very often. I couldn’t pass it up,” Mariano Wechsler told Yahoo News. The 27-year-old has studied with Acordeon for 14 years, taking breaks for high school and college. He’ll be carrying camera equipment and filming the trip along the way. Acordeon also hopes to raise funds for an organization he started that works with at-risk youth in Bahia. The trip is a challenge that Acordeon clearly embraces.